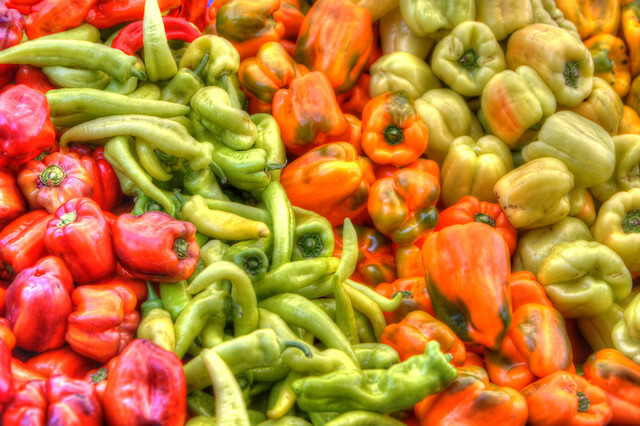 Pepper season has arrived at our local Menlo Park Farmers Market – and they look great! Our favorite pepper from local grower Happy Quail Farms isn’t actually shown in the image – be sure to try the Pimientos de Padrón, a specialty of the farm and a great accompaniment to almost any grilled meat dish! Many Bay Area chefs say the best locally-produced sweet and hot peppers come from this small East Palo Alto Farm. This photo was shot as a RAW with my Canon 5D Mark II using the Canon 70-200mm f/2.8 IS L lens from about 10 feet away. Photomatix Pro was just for post-processing with some final tweaks being done using Lightroom 3.